The 2018 ISCAID symposium was held in Portland, Oregon (USA) from September 30 to October 3, 2018. ISCAID once again joined forces with the International Feline Retrovirus Research Symposium (IFRRS) for our 5th biennial symposium. Being held at the Embassy Suites Downtown Portland, nestled along the Columbia River, this event to delivered cutting edge research presentations, renowned keynote speakers and plenty of opportunity to meet and reconnect with fellow veterinarians interested in infectious diseases. Keynote presentations by Paul Duprex (Boston University, Massachusetts), Colin Parrish (Cornell University, New York), and John Perfect (Duke University, North Carolina). A clinician’s day with world-renowned clinician scientists addressing clinical dilemmas and updates on infectious disease testing and treatment. The symposium dinner, was held at Southpark Seafood on Tuesday, October 2. RACE aproved for up to 20.5 continuing education units per veterinarian. We thank our sponsors for making this and other ISCAID activities possible. Who won the IDEXX-ISCAID student awards for research in companion animal infectious disease? How do I access proceedings? When and where will the next ISCAID symposium be held? 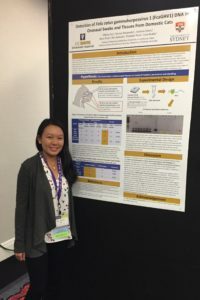 Congratulations to the winners of the IDEXX/ISCAID award for the best student research abstract/poster on infectious diseases of companion animals: Yasmin Parr and Tiffany Tse! In addition to this recognition, each awardee received $500 thanks to the generous sponsorship of IDEXX. 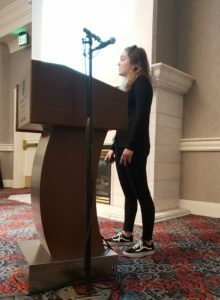 Yasmin Parr, a PhD student at the University of Glasgow Centre for Virus Research presented her work entitled ‘Investigating the humoral immune response in cats exposed to feline leukaemia virus’. The ISCAID/IFRRS 2018 Symposium proceedings can be accessed via the Veterinary Information Network (VIN). Conference attendees do not require VIN membership to access the proceedings. Full conference proceedings will be published on this site shortly. Where and when will the next ISCAID symposium be held? The 2020 ISCAID Symposium will be held in Glasgow, Scotland to follow the ECVIM-CA Congress at the beginning of September. Please stay tuned for more details and updates.